Nope. 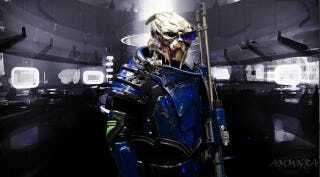 That's not a high resolution screenshot of Mass Effect's Garrus. It's the latest instalment in "Mass Effect Cosplayers Blow Our Socks Off". Cosplayer ammnra built this Garrus outfit that shakes the heavens with its amazingness, as almost everything is spot-on, from the chicken legs to the three-fingered gloves to battle damage to his trademark sensor getup on his weary, alien eye. The thing even lights up, with both the eye sensor and omni-tool (which appears to have been crafted for a Tali cosplayer) packed with LED lights.